The just published agenda for the monthly meeting of the Commission on Chicago Landmarks includes an item for "Preliminary Landmark Recommendation: Prentice Women's Hospital." What's in store for Thursday is still anyone's guess, but that the Commission is now officially considering designation is a major victory. You can find the list of Commissions on their website here. We should very respectfully and eloquently be making sure that each of them is fully aware of all the reasons that Bertrand Goldberg's masterpiece deserves official designation. You can also make sure that you're getting everyone who know, in Chicago and across the world, that believes in the importance of this building to sign the petition here. As Churchill once said, this is not the end, or even the beginning of the end, but it is end of the beginning. That the debate is now within the official context of the Landmarks Commission is a major achievement, but it is just the beginning. Keep the story of this essential work of Chicago architecture in the forefront of the public, and the Commission. The meeting of the Commission on Chicago Landmarks will take place this Thursday, June 2nd, beginning at 12:45 p.m., in City Council chambers, room 201-A, 121 North LaSalle. 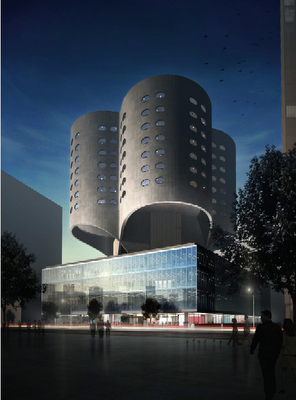 Supporters of the landmarking Prentice Hospital are urged to attend to lend their support.